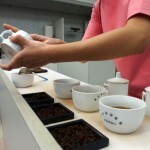 Cupping tea is a sensory process of tasting and evaluating the quality of loose leaf tea. For the past 3 years, Belle has been studying Chinese tea ceremony 茶艺 and tea grading 茶叶审评 at a Government technical college. In the beginner’s course, they give you 2 different samples of each tea type, and you have to judge which one is higher quality and why. 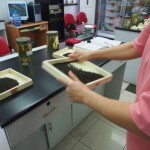 In the intermediate course, you have to correctly grade 3 different samples of each tea. 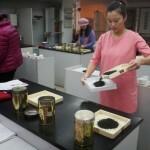 The classroom is made up of several tasting stations, each station consists of a black table and a white table, the black table is for grading the dry tea leaves, and the white table is for tea tasting & grading the wet tea leaves. On the black table are 3 tins, all of the same tea type. Starting with the first tin, pour all the tea onto a wooden tray, who’s Chinese name is Yáo pán (摇盘) or “shaking tray”. This specialised yáo pán has a light background designed to contrast with the dark tea leaves. Pour the tea from one tray to another. Do this 3 times, to evenly mix the tea leaves. 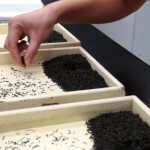 Then use two fingers to push about 150-200g of tea, onto one tray, whilst the remaining tea is poured back into the tin. Repeat this process with the 2nd tin, before proceeding to the 3rd. 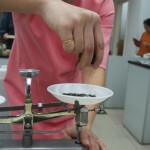 Carefully weigh 3g of tea for each tasting cup, 5g if it’s a Wulong tea. 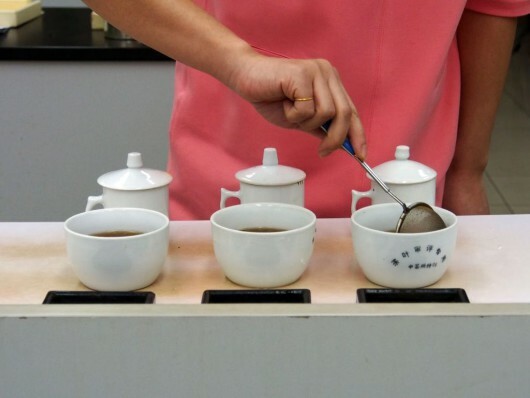 For long, Gaiwan’s are used instead of tasting cups, and the tea is infused 3 times instead of once (2 minutes for the first infusion, 3 minutes for the second infusion, and 5 minutes for the third infusion). 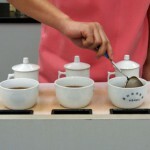 The tea is placed into tasting cups, and water is added. As the minerals in the water can greatly influence the flavour, it’s important to use the same filtered water, ideally freshly boiled. In the tea cupping & grading class, boiling water is used for all tea’s, they do not lower the water temperature for green teas (although they do in the tea ceremony class). With the exception of Wulong, most tea’s are left to infuse for 5 minutes. 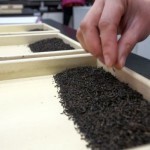 Meanwhile , he leftover dry tea leaves in the tray are gently centrifuged by hand, separating the dry leaves into layers. The larger, heavier leaves naturally gravitate towards the center of the yaopan, with the smaller, broken fragments at the edges. This makes it easier to compare the 3 samples, although to the untrained eye, they still look almost identical. 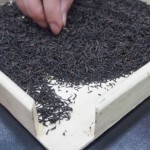 Taking the best tea leaves from the center of the heap and spreading them out on the empty part of the tray allows one to examine the best leaves whilst also exposing the middle layer. Comparing the top, middle and bottom of each pile, gives you a better idea of the overall quality of each sample. An electronic timer tells you when to pour the tea out. The tasting cups are placed on their side, so the edges of the bowl pin the lid to the cup body. If done right, the tea liquor drains into the tasting bowl, from a single hole in the cup. Getting the balance right takes a bit of practice, as the edge of the bowl only has a small overlap with the cup lid. If the lid is not tightly pressed to the cup, it will slip open, and tea & tea leaves will rush out the sides.The last few drops of tea have a lot of concentrated flavor, and every drop must be extracted from the cup for a fair tasting. A few quick flicks of the arm are sometimes necessary. Use a sieve to remove any stray leaf fragments or dust that might otherwise affect the tea flavor. The contents of the sieve are dumped onto the small black tray in front of each bowl, then the sieve is rinsed before moving onto the next bowl. Lifting the lid up slightly, analyze the aroma one nostril at a time. This reveals more aroma than using both nostrils at once, as each nostril activates different olfactory receptors. There is a standard desired aroma for each tea, for example, in the case of Bi Luo Chun green tea, you’re looking a very fresh, tender (嫩) & floral aroma. Unusual, weak or stale aroma indicate lower quality. Quality in these comparative tastings is relative. Sometimes all the samples are low quality, so the tea grader has to make an overall assessment based on multiple criteria to draw out the strengths & weaknesses of each tea. Other times there’s a tea which clearly stands out on apperance, and its superiority is quickly confirmed via aroma & tasting. There’s no time to stop to take notes. It’s important to assess the color of each tea and taste it before it cools. Especially with red tea and puer tea, the tea liquor can get cloudy as it cools. This can sometimes be a sign of high quality, as flavourful leaves release more caffeine, theaflavin, and polyphenols into the water. Using a porcelain tea spoon, take a short, noisy slurp of each tea. The purpose of slurping is to aerate the tea and spread it out over the entire palate at once. There is a spittoon under the table, but when only tasting a few teas, it’s better to swallow, and appreciate the feeling in the throat and the after taste. Be careful to rinse the spoon between slurps, to avoid contaminating your samples. Next, remove all the wet leaves from the tasting cup or gaiwan, and spread them out evenly on separate trays. Look for consistency in the leaf shape, texture and color. Leaves should be robust enough to rub between the fingers without desiccating. The brightness of the leaf color indicates quality. Now its back to examining the dried leaves. Tip the yáo pán to heap them down at one end. Take a pinch off the top and scatter it out. The light color of the yaopan makes it easier to examine the consistency of leaf shape and tightness of rolling. Usually it’s easier to determine the worst tea first, the top 2 grades can be harder to distinguish. When grading Qimen hongcha, we are looking for darker colour, more shiny instead of dull, and consistently narrow, tightly rolled leaves that look delicate but are unbroken – these are all indicators of higher quality tea leaves & greater care in processing. Lower quality leaves lack consistency, are loosely rolled, and often lack the sharp narrow bud tips, which have broken off during processing or handling. The last step is to write down your findings. The form shown below uses nomenclature such as APPEARANCE: leaf shape, consistency, cleanliness, color & brightness. SUBSTANCE: aroma, tea color, mouthfeel, wet leaves quality & hand feel. 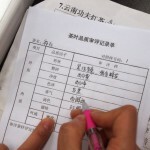 Filling out the form requires a thorough meditation on the outer and inner qualities of the leaf, and a good memory! 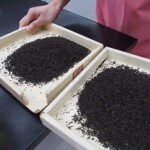 By this stage in the process, it is quite common to have spent over 30 minutes examining this tea, and the whole grading process must be completed within 40 minutes, before moving onto the next station. It is not as straight forward or as easy at it sounds, but it’s certainly fascinating, and fun! All of this equipment can be purchased online, and with this guide you can now try it for yourself at home! I highly recommend to visit their fabulous Tea Urchin webshop for premium teas and superior tea pots and tea wares.